The Arsacid Dynasty (Arshakuni Dynasty) ruled the Kingdom of Armenia from 54 to 428. Formerly a branch of the Parthian Arsacids, they became a distinctly Armenian dynasty. Arsacid Kings reigned intermittently throughout the chaotic years following the fall of the Artaxiad Dynasty until 62 when Tiridates I of Armenia secured Arsacid rule in Armenia. An independent line of Kings was established by Vologases II of Armenia (Valarses/Vagharshak) in 180. Two of the most notable events under Arsacid rule in Armenian history were the conversion of Armenia to Christianity by St. Gregory the Illuminator in 301, and the creation of the Armenian alphabet by Mesrop Mashtots in 405. When Tiridates III became a Christian in Tiridates III in 301, Armenia adopted Christianity as its official religion, the first state in history to do so. The Roman Empire did not adopt Christianity until 380, although it had been legalized in 313. Four almost four centuries, the Arsacids carefully maintained Armenia's independence from their more powerful neighbors. Founding the Armenian Apostolic Church, the oldest independent Church in the world, the Arsacids provided Armenians, who have often been ruled by larger empires, a past of which they could be proud and a cultural heritage that offered them a sense of identity wherever they lived in the world. This heritage, too, symbolizes a desire to be self-governing and free, not to dominate others. The first appearance of an Arsacid on the Armenian throne came about in 12 C.E., when the Parthian King Vonones I was exiled from Parthia due to his pro-Roman policies and Occidental manners. Vonones I briefly acquired the Armenian throne with Roman consent, but Artabanus II demanded his deposition, and as Augustus did not wish to begin a war with the Parthians he deposed Vonones I and sent him to Syria. Wasting no time Artabanus installed his son Orodes on the Armenian throne. Tiberius had no intention of giving up the buffer states of the Eastern frontier and sent his nephew and heir Germanicus to the East, who concluded a treaty with Artabanus, in which he was recognized as king and friend of the Romans. Armenia was given in 18 to Zeno the son of Polemon I of Pontus, who assumed the Armenian name Artaxias. The Parthians under Artabanus were too distracted by internal strife to oppose the Roman-appointed King. Zeno's reign was remarkably peaceful in Armenian history. Once Zeno died in 34, Artabanus decided to reinstate an Arsacid over the Armenian throne, choosing his eldest son Arsaces as a suitable candidate. The throne was disputed by the younger son of Artabanus, Orodes. Tiberius quickly concentrated more forces on the Roman frontier and once again after a decade of peace, Armenia was to become for twenty-five years the theater of bitter warfare between the two greatest powers of the known world. Tiberius, sent an Iberian named Mithridates, who claimed to be of Arsacid blood. Mithridates successfully recovered Armenia and deposed Arsaces causing much devastation to the country. Surprisingly, Mithridates was summoned back to Rome where he was kept a prisoner, and Armenia was given back to Artabanus who gave the throne to his younger son Orodes. Another civil war erupted in Parthia upon the death of Artabanus. Mithridates was put back on the Armenian throne, with the help of his brother, Pharasmanes I of Iberia, and Roman troops. Civil war continued in Parthia for several years with Gotarzes eventually seizing the throne in 45. In 51, Mithridates’ nephew Radamistus invaded Armenia and killed his uncle. The governor of Cappadocia, Julius Pailinus, decided to conquer Armenia but settled for crowning Radamistus who generously rewarded him. The current Parthian King Vologeses I, saw an opportunity, invaded Armenia and succeeded in forcing the Iberians to withdraw. The harsh winter that followed proved too much for the Parthians who withdrew, leaving the door open for Radamistus to regain his throne. Back in power, the Iberian was so cruel that the Armenians stormed the palace and forced Radamistus out of the country and Vologeses was able to put his brother Tiridates on the throne. Unhappy with the growing Parthian influence at their doorstep, Roman Emperor Nero sent General Gnaeus Domitius Corbulo with a large army to the east in order to restore Roman client kings. Tiridates escaped and a Roman client king was setup again. The Roman appointed King Tigranes VI invaded the Kingdom of Adiabene in 61, which was a vassal of Parthians. Vologeses considered this as an act of aggression from Rome and restarted a campaign to put Tiridates back on the Armenian throne. Following the Battle of Rhandeia in 62. The command of the Roman troops was again entrusted to Corbulo, who marched into Armenia and set a camp in Rhandeia, where he made a peace agreement with Tiridates upon which Tiridates was recognized king of Armenia but he would be a client of Rome. Tiridates agreed that he would go to Rome to be crowned by Nero. Tiridates ruled Armenia until his death or deposition around 100/110. Osroes I of Parthia invaded Armenia and placed his nephew Axidares, the son of Pacorus II as King of Armenia. Greater Armenia as part of the Roman Empire (in red), Lesser Armenia (in blue). This encroachment on the traditional sphere of influence of the Roman Empire ended the peace since the time of Nero some 50 years earlier and started a new war with the Roman emperor Trajan. Trajan marched towards Armenia in October 113, to restore a Roman client king in Armenia. At Athens Osroes’ envoys met him, informing him that Axidares had been deposed and asking that the latter's elder brother, Parthamasiris, be granted the throne. Trajan declined and by August 114, he captured Arsamosata where Parthamasiris asked to be crowned, but instead of crowning him, he annexed the kingdom to the Roman Empire. Parthamasiris was dismissed and died mysteriously soon after. As a Roman province Armenia was administered along with Cappadocia by Catilius Severus of the gens Claudia. The Roman senate issued coins on this occasion bearing the following inscription: ARMENIA ET MESOPOTAMIA IN POTESTATEM P.R. REDACTAE,' thus solidifying Armenia's position as the newest Roman province. A rebellion by a Parthian pretender Sanatruces was put down, though sporadic resistance continued and Vologases III of Parthia managed to secure a sizeable chunk of Armenia just before Trajan's death in August of 117. However, in 118 the new Emperor Hadrian gave up Trajan's conquests including Armenia and made Parthamaspates King of Armenia and Osroene, though Vologases III held most of the country. A compromise with the Parthians was reached eventually and the Parthian Vologases was placed in charge of Armenia. He ruled Armenia until 140 C.E. Vologases IV of Parthia dispatched troops to seize Armenia in 161 and eradicated the Roman legions stationed there under legatus C. Severianus, encouraged by the spahbod Osroes, Parthian troops marched further West into Roman Syria. Marcus Aurelius immediately sent Lucius Verus to the Eastern front. In 163, Verus dispatched General Statius Priscus who was recently transferred from Britain with several legions to Armenia from Antioch. Vologases' army surrendered in Artaxata and Priscus installed a Roman puppet, Sohaemus (a Roman senator and consul of Arsacid and Emessan ancestry) on the Armenian throne, deposing a certain Pacorus installed by Vologases III. Coin issued to celebrate the victory of Lucius Verus Armeniacus against Vologases IV of Parthia in the war for Armenia. As a result of an epidemic within the Roman forces, Parthians retook most of their lost territory in 166 and forced Sohaemus to retreat to Syria. After a few intervening Roman and Parthian rulers, the son of Vologases I of Armenia, Vologaes II assumed the throne in 186 C.E. In 191, he assumed the Parthian throne and named his son Khosrov I to the Armenian throne. Khosrov was subsequently captured by the Romans, who installed one of their own to take charge of Armenia. However the Armenians themselves revolted against their Roman overlords, and, in a new Rome-Parthia compromise, Khosrov's son, Trdat II (217-252 C.E. ), was made king of Armenia. In 224 C.E., Ardashir I overthrew the Arsacids in Parthia and began the new Persian Sassanid dynasty. The Sassanids were determined to restore the old glory of the Achaemenid Persia, making Zoroastrianism the state religion and claiming Armenia as part of the empire. To preserve the autonomy of Arshakuni rule in Armenia, Trdat II sought friendly relations with Rome. This was an unfortunate choice, because the Sassanid king Shapur I defeated the Romans and struck a peace with the emperor Philip, whereby Rome acquiesced to paying tribute and relinquishing control of Greater Armenia. In 252 C.E. Shapur invaded Armenia and, forcing Trdat to flee, installed his own son Hurmazd on the Armenian throne. When Shapur died in 270 C.E., Hurmazd took the Persian throne and his brother Narseh ruled Armenia in his stead. Under Diocletian, Rome tried to install Khosrov II as ruler of Armenia, and between 279 and 287 C.E. he was in possession of the western parts of Armenian territory. But the Sasanids stirred some nobles to revolt, killing Khosrov in the process. When Narseh left to take the Persian throne in 293 C.E., Khosrov's murderer was installed on the Armenian throne. Rome nevertheless defeated Narseh in 298 C.E., and Khosrov's son Trdat III regained control of Armenia with the support of Roman soldiers. 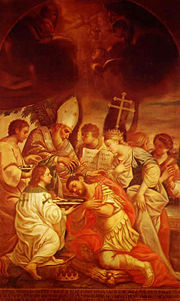 Baptism of Tiridates III of Armenia. In 301, St. Gregory the Illuminator converted King Tiridates III and members of his court  Before his conversion, Tiridates had persecuted Christians. Difference of opinion about the date of Tiridates—302 according to Armenia tradition, 313 (the year Constantine I converted—according to other sources may be explained by the desire to depict Tiridates' conversion as "independent of that of … Constantine" because this "would make Christianity less suspect" to their powerful Persian neighbors. Gregory was appointed first Catholicos or Patriarch of what became the Armenian Apostolic, or Orthodox Church. Earlier, he had imprisoned him for 13 years. The Armenian alphabet was created by Saint Mesrop Mashtots in 406 for the purpose of translating the Bible, and Christianization at thus also marks the beginning of Armenian literature. According to Moses of Chorene, Isaac of Armenia made a translation of the Gospel from the Syriac text about 411. This work must have been considered imperfect, for soon after John of Egheghiatz and Joseph of Baghin were sent to Edessa to translate the Scriptures. They journeyed as far as Constantinople, and brought back with them authentic copies of the Greek text. With the help of other copies obtained from Alexandria the Bible was translated again from the Greek according to the text of the Septuagint and Origen's Hexapla. This version, now in use in the Armenian Church, was completed about 434. In 337, during the reign of Khosrov III the Small, Shapur II invaded Armenia. Over the following decades, Armenia was once again disputed territory between East Rome and the Sassanid Empire, until a permanent settlement in 387, which remained in place until the Arab conquest of Armenia in 639. Arsacid rulers intermittently remained in control, as governors (marzban) under either Byzantine or Persian protectorate, until 428. Herzig and Kurkchiyan say that the importance of the Arsacid Dynasty "to Armenian society cannot be overestimated." Located between the rival empires of the Romans and of the Persians, the Arcadis had to "maximize their own advantage by balancing between" these more powerful neighbors. For much of the time, they succeeded. In the main, the Arsacids wanted to maintain their independence, not to conquer other people's land. Armenian literature in the fifteenth and sixteenth centuries characteristically represented peace and freedom as the hope and dream of the whole Armenian people. After their fall, Armenia entered a long period under the rule of larger imperial entities, beginning with the Sassanid Empire, then under the Islam Caliphate from 636 C.E. until 884. Then, under the Bagratuni dynasty ("hereditary vassals of the Arsacids"), Armenia was again independent until conquered by the Byzantine Empire in 1045. By 1071, the Seljuk Turks had added Armenia to their Empire. By 1500, the Ottoman Empire and the Safavid Empire had divided Armenia between themselves. In the nineteenth century, Russia acquired Eastern Armenia. This became an independent, sovereign nation-state in 1991, after the collapse of the Soviet Union. The Armenian Church established under the Arsacids remains the oldest independent Church in the world. Armenian culture became so entwined with the Armenian form of Christianity that despite a large Diaspora (about 8 million Armenians live outside of the modern state of Armena, which has a population of approximately 3 million) and centuries under imperial rule, Armenians have maintained a strong sense of identity. The Church "remains important to Armenian identity for a number of reasons" write Herzig and Kurkchiyan; "It provides a link with the ancient past," "preserves the classical language," and politically linked Armenians with Europe "through a shared Christianity" while also connecting "people throughout the Diaspora." Under Ottoman rule, they were recognized as a millet, led by the Armenian Patriarch of Constantinople. This helped Armenians to preserve their culture and customs. As Armenian nationalism gained momentum in the nineteenth century, even the most ardent secularists among the leaders of the movement acknowledged the role played by the Church in preserving ethnic consciousness. The Arsacid Dynasty's legacy lives on in a people who look back with pride on a four hundred year long period of their history and in a Church that still attracts the loyalty of 94 per cent of the population of Armenia. Two-thirds of the members of the Church Assembly are lay, including representatives from the Diaspora. ↑ Olson, Pappas, and Pappas (1994), 42. ↑ 2.0 2.1 Armenian History, Armenia becomes the first Christian nation. Retrieved October 19, 2008. ↑ Josephus, Jewish Antiquities, 18.4, Wesley Center for Applied Theology. Retrieved October 19, 2008. ↑ Tacitus, Annals, 2.43, 2.56, MIT, Translated by Alfred John Church and William Jackson Brodribb. Retrieved October 19, 2008. ↑ Grolier Incorporated, Academic American Encyclopedia (Danbury, CT: Grolier, 1991, ISBN 9780717220342), 172. ↑ William Smith and Henry Wace, A Dictionary of Christian Biography, Literature, Sects and Doctrines, Being a Continuation of "The dictionary of the Bible" (London, UK: J. Murray, 1880), 692. ↑ Herzig and Kurkchiyan (2005), 33. ↑ Herzig and Kurkchiyan (20050, 41. ↑ Herzig and Kurkchiyan (2005), 142. ↑ Vigen Guroian, Religion and Armenian National Identity: Nationalaism Old and New, Newberg, OR: George Fox University. Retrieved October 19, 2008. ↑ World and its Peoples. Bahrain, Oman, Qatar, Saudi Arabia, UAE, Yemen. Arabian Peninsula (Tarrytown, NY: Marshall Cavendish, 2007, ISBN 9780761475729), 773. Birley, Anthony Richard. 1976. Lives of the Later Caesars: The First Part of the Augustan History: With Newly Compiled Lives of Nerva and Trajan. Harmondsworth, UK: Penguin Books. ISBN 9780140443080. Hacikyan, Agop J. 2002. The Heritage of Armenian Literature 2 From the Sixth to the Eighteenth Century. Detroit, MI: Wayne State Univ. Press. ISBN 9780814328156. Herzig, Edmund, and Marina Kurkchiyan. 2005. The Armenians Past and Present in the Making of National Identity. Caucasus World. New York, NY: RoutledgeCurzon. ISBN 9780203004937. Hovannisian, Richard G. 1997. The Armenian People From Ancient to Modern Times. From Antiquity to the Fourteenth Century vol. 1, The Dynastic Periods. New York, NY: St. Martin's Press. ISBN 9780312101695. Olson, James Stuart, Lee Brigance Pappas, and Nicholas Charles Pappas. 1994. An Ethnohistorical Dictionary of the Russian and Soviet Empires. Westport, CT: Greenwood Press. ISBN 9780313274978. Potter, D.S. 2004. The Roman Empire at Bay: AD 180-395. London, UK: Routledge. ISBN 9780415100571. Redgate, A.E. 1998. The Armenians. Oxford, UK: Blackwell Publishers. ISBN 9780631143727. Armenian History: Arshakuni Dynasty by Levon Zekiyan. The Arshakuni Dynasty of Armenia by Vahan M. Kurkjian. History of "Arsacid Dynasty of Armenia"
This page was last modified on 15 April 2016, at 15:46.